"I remember being wowed by my Nan's long garden full of flowers when I was 6, and of having my school packed lunch up a tree every day of the week, instead of in the school hall, even making shelters to hideout from the rain. When my own kiddies were crawlers, they spent many happy days rolling in the mud while we had a go at growing our own down at the Locksway Rd Allotments. They learnt that food grew out of the ground, not just little frozen packets in the supermarket. What was it I sensed as a 10 year old, and still drives me now all these years later? I think it might be a fascination with life in our evolving climate, and a sense of responsibility for the unfolding consequences of urbanisation, that made me start to think like this. Our #keeppompeygreen campaign is a response to 5 years of trying to be a community co-op growing and swapping food surplus; marketing the city gardening competition and the aims of Southsea Greenhouse (which were pretty aspirational) and all the great work our friends are doing to recycle and share resources and not waste food or damage the environment. The preview night was a success! 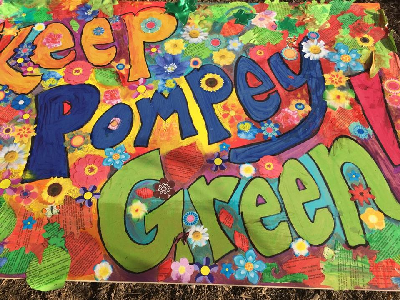 So many beautiful artworks by our entrants, sending the message to keep and look after our green-spaces in Pompey. All the artwork can be seen at Le Café Parisien by The University of Portsmouth from now until after Christmas. They will then be displayed at Lakeside. To our entrants who all showed how much you care for a greener Portsmouth. We look forward to the same enthusiasm next time and don’t forget, keep spreading the word!